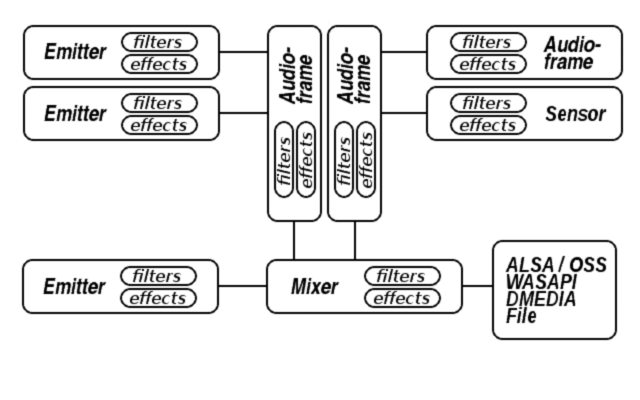 For AeonWave the mixer constructs the final output signal from the various registered emitters and audio-frames and places them properly in the stereo image at the proper pitch and volume. This is done at the defined sample frequency and taking into account the requested output format; either stereo, spatialized multi-speaker output or binaural headphone playback. The mixer is also used to control the playback state like playing, paused, stopped or recording. In addition the mixer supports a special standby mode which is equal to playback but skips the rendering stage. This means that (in contrast to pause) position and orientation updates still get processed but no audio will be sent to the driver backend. This state is useful to reduce battery power consumption for low power devices. The mixer of AeonWave supports up to 256 attached sound sources which can either be an emitter, an audio-frame or a sensor. 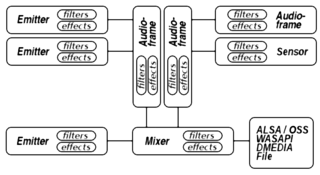 Enabled filters or effects will have an effect on the appearance of all attached sound sources. The mixer supports a parametric equalizer with two cut-off frequencies (with user defined resonance factors or Q-factors) and three frequency band gain settings (high-mid-low with variable cut-off frequencies). In addition to the parametric equalizer the mixer also supports an 8-band graphic equalizer with fixed cut-of frequencies and Q-factors.